Living at home and going about daily activities without fear of injury is essential to maintaining a high quality of life. As we strive to age in place, seniors living at home independently face many challenges as age progresses. Falls are not rare or occasional, and they are the most common home injury threat for the elderly. Every year, one third of Americans 65 and older suffers a fall that which leads to moderate or severe injuries and increases the risk of early death. More than 662,000 of adults were hospitalized due to non-fatal fall injuries. Between 20-30% adults who fall suffer from moderate to severe fractures, head traumas and lacerations. Over 95% of hip fractures are caused by falls. Seniors 75 and older who fall are four to five times more likely than those between ages 65-74 to be admitted to a long-term care facility for a year or longer as a result of falls in the home. activities for all age groups are bathing and showering. 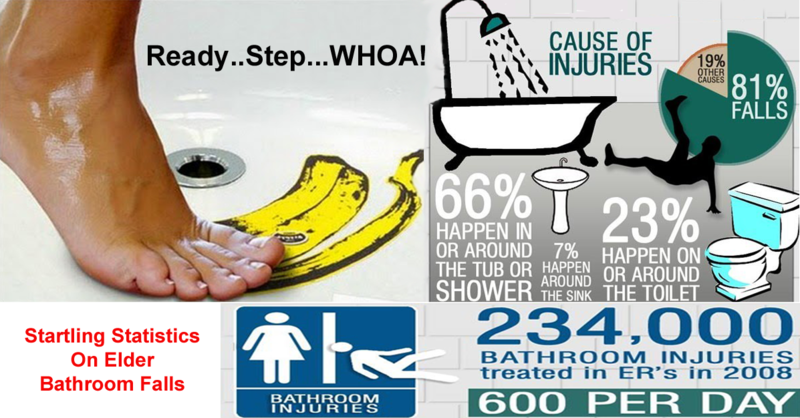 Of all bathroom injuries, those occurring in or near the bathtub or shower account for more than two-thirds of hospital emergency room visits. 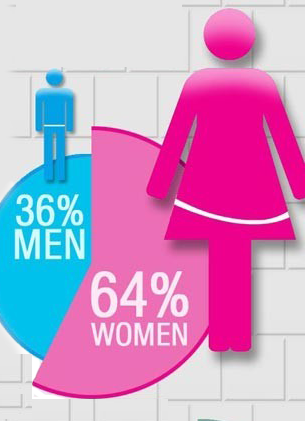 It is also good to be aware that women are more likely to suffer bathroom injuries than men, with about 64 percent of accidents affecting women. Falling accounts for a little over 80% of accidents. Bath injuries are a frighteningly common event that not many people think about; after all, the bathroom is a place you visit several times a day, usually with no event. 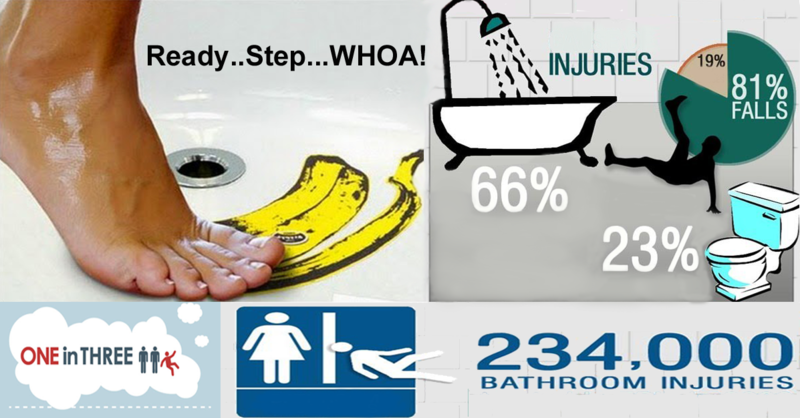 The number of injuries that occur in or around the shower makes sense as these areas do get slippery when wet. It is advisable to install non-movable no-slip strips or surface coverings on the shower or tub floor, as well as a non-slip mat or rug to place immediately outside of the shower. 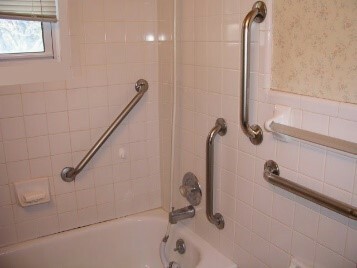 It is also a good idea to install grab bars in your shower and near your toilet. A fall can steal your independence and alter your life in a moment. It is always in the back of our mind that a slip or fall would result in a long recovery period, reducing our enjoyment of life. This has meant that for many, instead of being an integral part of the daily routine, the shower is feared and often avoided to reduce the risk of harm. Of course, avoiding showering is not a viable solution to the problem and often leads to other complications that reduce quality of life. Medications, frailty, MS, Parkinson’s, Alzheimer’s and other conditions are all contributory to trouble navigating the most dangerous room in the house. For seniors not so sure-footed for any reason, a bath visit can preserve your ability to continue to age in place and enjoy independence for years. Home Care Agencies may offer bath visits with a licensed nursing assistant trained to help keep you safe when bathing and showering. Some, like BrightStar Care of Delray Beach, make the experience enjoyable like a spa, helping assist you to bath, groom and dress in a relaxed and pampering manner. You don’t need to be a senior to enjoy that! If your doctor feels that you need help with bathing and getting to the bath or dressing, long term care insurance will likely pay the bill! That can be a very good use for the coverage you paid into for years, helping you to avoid a more serious injury which can steal the quality of life.